Lostboy! album A Blast From The Future!! Lostboy AKA! 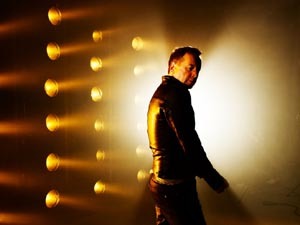 This edition’s exclusive interview and featured artist is legendary Simple Minds front man Jim Kerr with the release of one of the most highly anticipated solo projects of 2010. Having enjoyed a successful career with Simple Minds for over 30 years, Jim now has a collection of his own songs. From the influences and inspirations that paved the path for one of the most influential bands in history, Jim created an alter ego Lostboy! AKA to perform and compose songs which recreate the inspiration and the desire he felt as a frustrated young musician. As with all songs that Jim has written over the years, to find the true essence of any song is to play it live and that same ethos is transpired to Lostboy AKA. I caught up with Jim to find out what is behind this build up of songs that have been drifting around with him for all these years and why now! 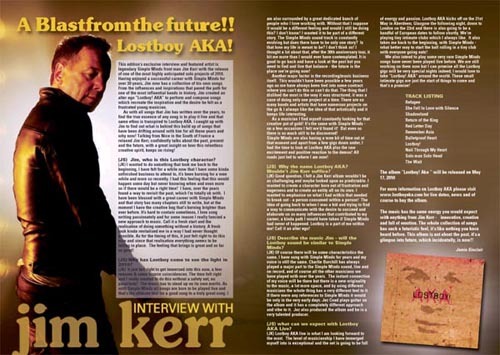 Talking from Nice in the South of France a relaxed Jim Kerr, confidently talks about the past, present and the future, with a great insight on how this relentless creative spirit, keeps on rising! JS: Jim, who is this Lostboy character? JK: I wanted to do something that took me back to the beginning, I have felt for a while now that I have some kinda unfinished business to attend to, it’s been burning for a wee while and more so recently. I had this feeling that this would happen some day but never knowing when and even more so if there would be a right time! I have, over the years found a way to revisit the past, which I'm totally ok with. I have been blessed with a great career with Simple Minds and that story has many chapters still to write, but at the moment I have the creative bug that’s burning brighter than ever before. It’s hard to contain sometimes, I love song writing passionately and for some reason I really fancied a new approach to music. Call it a fresh start and the realisation of doing something without a history. A fresh look kinda revitalised me in a way I had never thought possible. As for the timing of this, it just felt right to do this now and since that realisation everything seems to be falling in place. The feeling that brings is great and so far so good! JS: Why has Lostboy come to see the light in 2010? JK: It just felt right to get immersed into this now, a few reasons & some bizarre coincidences. The time felt right and I really wanted to do this without a safety net, no parachute! The music has to stand up on its own merits. As with Simple Minds all songs are born to be played live and that’s the ultimate test for a good song to a truly great song. I am also surrounded by a great dedicated bunch of people who I love working with. Without that I suppose it would be a different feeling and would I still be doing this? I don’t know! I wanted it to be part of a different story. The Simple Minds sound track is constantly evolving but does there have to be only one story? Is that how my life is meant to be? I don’t think so! I thought a lot about that, after the 30th anniversary tour, it hit me more than I would ever have contemplated. It is good to go back and have a look at the past but you need to find and live that balance - the future is the place we’re going now! Another major factor is the recording/music business itself. This wouldn’t have been possible a few years ago as we have always been tied into some contract where you can't do this or can't do that. The thing that I disliked the most is the way it was structured, it was a case of doing only one project at a time. There are so many bands and artists that have numerous projects on the go and I always like the idea of that artistically and it keeps life interesting. As a musician I find myself constantly looking for that creative pot of gold! It's the same with Simple Minds - on a few occasions I felt we‘d found it! But even so there is so much still to be discovered! Simple Minds are also having a wee bit of time out at that moment and apart from a few gigs down under, I had the time to look at Lostboy AKA plus the raw excitement and positive reaction to the demos! All roads just led to where I am now! JS: Why the name Lostboy AKA? Wouldn’t Jim Kerr suffice? JK: Good question, I felt a Jim Kerr album wouldn’t be as challenging and maybe looked upon as predictable. I wanted to create a character born out of frustration and eagerness and to create an entity all on its own. I wanted to emphasise on what I had within that needed to break out - a person consumed within a person! The idea of going back to when I was a kid and trying to find a way to communicate with the desire to succeed and elaborate on so many influences that contributed to my career, a kinda path I would have taken if Simple Minds had never of happened. Lostboy is a part of me within me! Call it an alter ego! JS: Describe the music Jim - will the Lostboy sound be similar to Simple Minds? JK: Of course there will be some characteristics the same, I have sung with Simple Minds for years and my voice is still the same. Charlie Burchill has always played a major part to the Simple Minds sound, live and on record, and of course all the other musicians we have played with over the years. The instant connection of my voice will be there but there is a new originality to the music, a lot more space, and by using different musicians the whole thing has a very different feel to it. If there were any references to Simple Minds it would be only in the very early days. Jez Coad plays guitar on the album and it has a completely different approach and vibe to it. Jez also produced the album and he is a very talented producer. JS what can we expect with Lostboy AKA Live? JK: Lostboy AKA live is what I am looking forward to the most. The level of musicianship I have immerged myself into is exceptional and the set is going to be full of energy and passion. Lostboy AKA kicks off on the 21st May in Aberdeen; Glasgow the following night, down to London on the 23rd and there is also going to be a handful of European dates to follow shortly. We’re playing tiny intimate clubs which I always like. It also takes me back to the beginning, with Simple Minds - what better way to start the ball rolling in a tiny club with everyone going nuts! We also intend to play some very rare Simple Minds songs have never been played live before. We are still working on them now but I can promise all the Lostboy gigs will be very special nights indeed; I would love to take "Lostboy! AKA" around the world. These small intimate gigs are just the start of things to come and that’s a promise! For more information on Lostboy AKA please visit www.lostboyaka.com for live dates, news and of course to buy the album. The music has the same energy you would expect with anything from Jim Kerr - innovative, creative and full of emotion. The whole collection of songs has such a futuristic feel, it’s like nothing you have heard before. This album is not about the past, it’s a glimpse into future, which incidentally, is now! !